I love Guest Post Mondays! Today I am so happy to bring you a spring-y post! 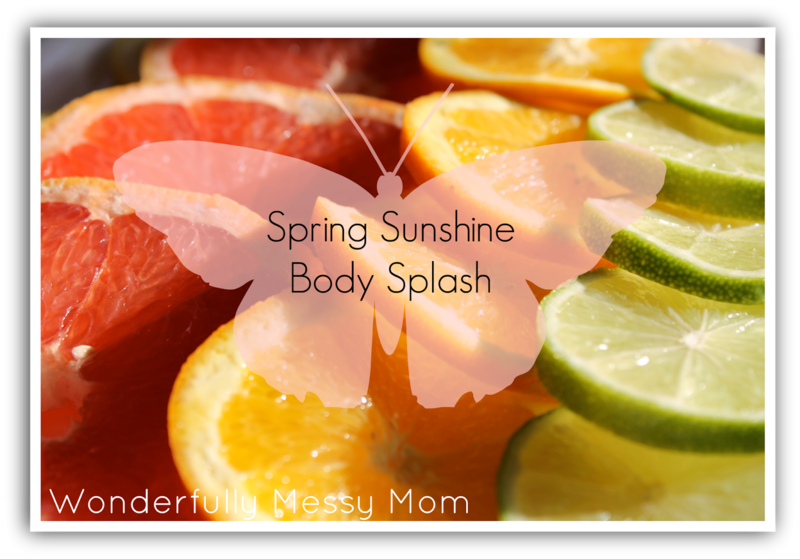 Brandy from Wonderfully Messy Mom is going to share with us her recipe for a citrus body splash that will have you smelling like spring in no time! 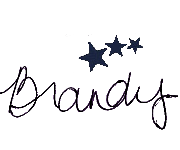 Hello Miranda Bee readers! Spring is right around the corner, I can feel the air changing and I hear the birds chirping, can’t you!!?? When I think of spring, I think of freshness! So today I want to share a body splash that will help you think spring. But first I want to introduce myself. 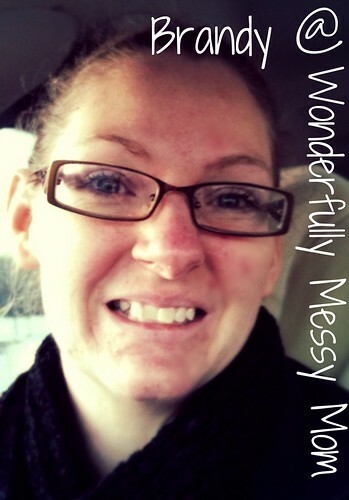 My name is Brandy, I blog over at Wonderfully Messy Mom. ~ I love to wear flip flops. I wear them until it snows, then I get practical and wear my cowboy boots. If there is not snow on the ground or below freezing, those flip flops are on!! ~ I love to cook. I just do not make very pretty dishes so I do not share them very often on my blog! No one wants to see all that! ~ I only put a clear coat on my nails, I never use color!! And I am OK with that, they look great that way. Ok, enough about my messy self! On to the good stuff! A body splash is a light fragrance spray, it will not last all day. But not very many that you buy retail last all day either! Now before I share this recipe, I will say I do not drink alcohol, the vodka used in this recipe can be replaced with rubbing alcohol if you so choose, but I prefer to use 100 proof vodka for these kind of recipes. The vodka or rubbing alcohol is used to break down the essential oils and acts as a carrier oil so to speak. If you boil your water, wait until it is at room temp before you do anything! The heat breaks down the essential oils and they will not be very fragrant. 1.) Get your bowls/jars and spray bottles ready. 2.) Put alcohol and essentials together in container and shake for several minutes. Then add your water. 3.) Shake again for several minutes. 4.) Place inside container of choice and store in a cool dark place, you can also place in fridge for a cool refreshing spray. This will keep indefinitely (but remember light and heat destroy the essential oils, so keep in a cool, dark place). 1.) Juice the lime, strain out any seeds and pulp. 2.) Combine all your ingredients into container of your choice. Shake well before each use. 3.) Dab onto pulse points. 4.) Store in the fridge. This version is weaker than the first and will not keep forever. I would throw this out after a month or if it starts to look weird or not smell the same as when you made it. I really enjoy spring time, it’s my favorite season. I am longing for it right now after this long cold winter! Having something like this body splash around makes these harsh days more bearable, it reminds me spring is almost here! Just an FYI- you can play around with the essential oils and use whatever fragrance you prefer!! It’s so much fun to try new things! Let me know if you tried it and what you think about it! I'm planning on making scrubs for gifts this year so this is awesome! I love the smell of citrus, Brandy and this sounds so good…. This would be a good one to add!! Hope you like it! You would love it! Its so refreshing! This sounds like a great recipe. I'm sure going to try this! I bet this smells amazing. But I don't know if I can waste vodka like that! Oh, I love that! all natural and smells great I bet! I love it myself! I hope you like it! That is does! Have a blessed day! Hahaha! It does smell great, you could use rubbing alcohol instead! Oh yes, to both! Have a great day! Sounds really delicious (I know it's not for eating, lol). But I bet it will smell delicious also. Thank you for the recipe! I love a lemony fragrance and the fact this is all natural makes it even more attractive! Thanks so much for the recipe!